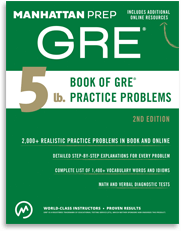 New Edition of the 5 lb Book of GRE Practice Problems: Even Better Practice! Today the second edition of our 5 lb. Book of GRE Practice Problems comes out. Oodles of hours of hard work have gone into this edition, and we’re proud to share it with you. You’re getting more problems—over 2,000—in a slightly lighter package (still over 5 lbs, of course). How? Technology! We’ve put close to 500 of these problems online. Almost two hundred of these beauties are brand-new, so register your book and check them out. In the physical package, you’ll still get your fill of solid problems, both new and re-written. We closely examined every first-edition problem for its GRE-likeness. Problems that needed an overhaul got one. 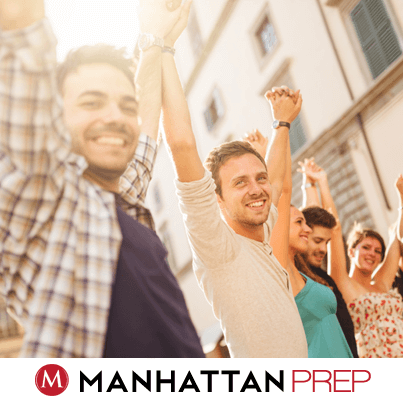 In verbal, for instance, you’ll still find tough vocabulary—just as you will on the GRE itself. But you’ll find a better balance of tough sentence structures and fact patterns—just as the GRE presents. In small ways and large, we’ve labored to make the look and feel of every problem ever more GRE-like. We replaced slash fractions (such as 1/2) with horizontal-line versions. We slid the numbering of QC questions so that the given information is actually above the number, because that’s how the Official Guide does it. We scrubbed and buffed the text of questions to a fine shine, in order to reflect the tiniest nuances of GRE style. We also thoroughly edited our explanations. Where things were a little unclear before, we clarified them. The “voice of the teacher” comes through even better now. In all of this work, we listened to you. We studied what you liked—and didn’t—about the first edition. Our endeavor has been to correct deficiencies and build upon strengths. We hope you find the second edition an even better resource than the first.